I went to Bacchus for brunch. 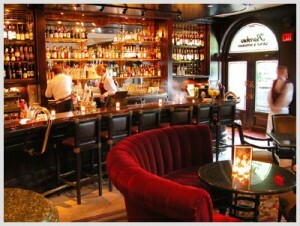 Bacchus is the restaurant at the lovely Wedgewood hotel downtown at Hornby and Robson …um. what can I say? The service is excellent. However, that excellence is not reflected in the food. I ordered a breakfast parfait ($9). Y’know the one: granola, yogurt, seasonal fruit. That was basically what I got – except the seasonal fruit was pineapple and watermelon. Don’t get me wrong: I LOVE tropical fruits. But not all fruit was meant to be eaten with yogurt. And by this I mean: IT WAS SO FREAKIN’ WEIRD! Those fruits should not be in a parfait! Strawberries, yes. blueberries, yes. blackberries, raspberries…the list of approved parfait fruit goes on and on. But I draw the line at watermelon….well actually, no. I ate the watermelon. What I couldn’t stomach was the basil. Who the hell thinks savory seasoning goes in a parfait?! And this was no accident. There was carefully chiffonaded basil tucked throughout the majority of the parfait. WORST PARFAI T EVERRRRRRRRRRR! All my dining compainions seemed perfectly content with their eggs and pancakes so maybe order that instead. Or perhaps skip the whole thing. Who wants to pay $22 for a continental anyway? I guess I do – because I went back to Bacchus a second time. And I know you’re asking what kind of amazing continental breakfast costs $22? Apparently a croissant and coffee. Perhaps there was more – but they didn’t offer it and I didn’t demand it. Thank you, Bacchus, for reaffirming my long standing opinion that hotel restaurants are the worst. It’s nice to be proven right. You can look at the entire Bacchus menu here – and upon further review it seems that the parfait is also included in the continental breakfast. Thank god they didn’t try to feed it to me again. I would have thrown a fit. 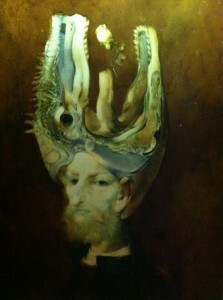 However, on the way to the bathrooms there was this amazing painting. It made it all worthwhile…. almost. You would have to be high to have enjoyed that parfait. This entry was posted in Food, Music, Restaurant Reviews and tagged Bacchus, breakfast, brunch, downtown, eggs, elegant, fancy, fine dining, hornby, hotel, lunch, parfait, restaurant, robson, Vancouver, wedgewood. Bookmark the permalink.